This is the fourth in my series featuring the popular potato, America’s favorite starch, in four main dish vegetarian recipes that are quick and easy enough to prepare on a weeknight after work, school, soccer practice, during homework time, etc. All are vegetarian recipes perfect for #MeatlessMonday, or Tuesday through Sunday. My mission is to demonstrate ways in which the humble spud can be the leading main instead of type cast as a side dish that is most often fried or dressed with high-calorie condiments. Mr. Potato gets a bad rap for being a carb and highly caloric when in reality a medium-sized potato has only 110 calories and can be delicious without all the added fat that is usually heaped upon it. A potato is also very nutritious – high in Vitamin C, and B6, Potassium, fiber, and simple and complex carbohydrates necessary to energize our minds and bodies.With no fat or cholesterol, potatoes are also heart healthy and have been certified by the American Heart Association as a heart healthy food. An added bonus: they are naturally gluten free and one of the most inexpensive foods you can buy. Probably the best thing about potatoes is their versatility and compatibility with other foods – you can eat them for breakfast, lunch, or dinner and there are a gazillion ways to prepare them. The proof is in the potato. 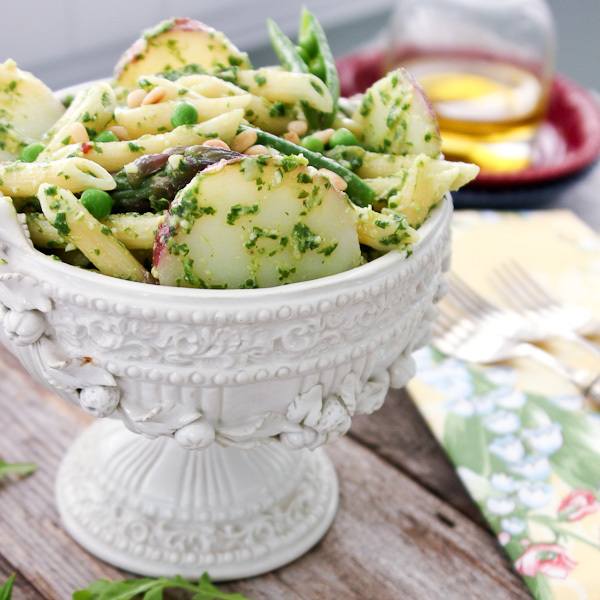 In case you missed the previous recipes: the Fully Loaded Idaho® Baked Potato, Slow Cooker Idaho® Potato Tacos, Purple Idaho® Potato Pizza and, last but not least, today’s Penne with Arugula Pesto, Idaho® Red Potatoes, Asparagus, and Sugar Snap Peas – a celebration of Spring! College Girl and I are huge fan of traditional pesto, the classic Genoese sauce of basil partnered with garlic, olive oil, pine nuts, and Parmesan and/or Pecorino Romano cheeses, my husband, not so much. I quickly discovered that pesto can be made from practically any green leafy herb or vegetable and the man prefers the kale, parsley and arugula pestos that I’ve created – with and, more often, without cheese due to his sodium restriction. Still delicious (and vegan friendly), I assure you. *Edit 7/13/13 – In response to your wonderful comments about the pairing of pasta and potatoes – it is a popular dish of coastal Liguria in northwestern Italy bordering France. A delicious vegan dish that celebrates the glory of Spring with fresh, crisp asparagus and sugar snap peas. Pair with green beans when summer’s bounty arrives. Bring a large pot of water to boil over medium high heat. Blanche the asparagus for 2 minutes, use tongs to remove to an ice bath. Add the sugar snap peas and cook for 2 minutes. Remove with a slotted spoon and transfer to a colander. Add additional water to the pot if necessary and bring to a boil before adding the pasta and potatoes. Cook according to package directions, usually 9-11 minutes which is sufficient time to cook the potatoes al dente as well. Drain, reserving 1/2 cup of the cooking liquid. Remove the potatoes and set aside to cool – they should be firm and will continue to cook. You do not want them to be soft or you won’t be able to slice them. Do not rinse the pasta – the sauce will coat the pasta instead of sliding off. Meanwhile, add all the pesto ingredients and half of the olive oil to a mini food processor. Pulse several times, stopping to scrape the mixture from the sides once or twice and then add the remaining olive oil, pulse until fully incorporated. Leaving the skin on, slice the potatoes into 1/4 inch slices using a sharp knife or mandolin. You may peel the potatoes if you prefer – I like the color that the skin-on potatoes add to the dish and just removed any peel that came away when slicing. Heat the pot with a tablespoon of olive oil over medium heat. Transfer the pasta to the pot, stir to break up clumps and coat with olive oil, add the cooking liquid and mix in the pesto. Gently fold in the asparagus and snap peas and reheat for 2-3 minutes, stirring once or twice to heat evenly. 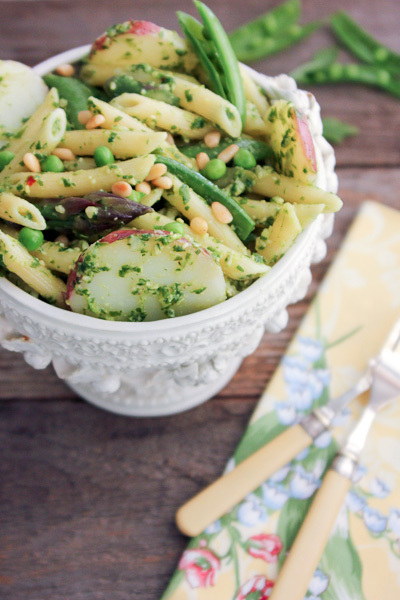 Serve in pasta bowls and garnish with a few shelled peas and toasted pine nuts. In case you’re wondering why Idaho® potatoes, we all know that Idaho is known for potatoes, but they are also grown in other places, to be sure you’re getting genuine, top-quality Idaho Potatoes, look for the “Grown In Idaho” seal. Idaho’s growing season of warm days and cool nights, mountain-fed irrigation and rich volcanic soil, give Idaho Potatoes their unique texture, taste and dependable performance in your kitchen capers. See more of the deliciously healthy recipes I developed on Idaho Potatoes’ website. Nutrition Analysis via MyFitnessPal.com. Eliminate the salt for low sodium diets. Disclosure: I was compensated by the Idaho Potato Commission for developing this recipe, the recipes and opinions expressed are my own. 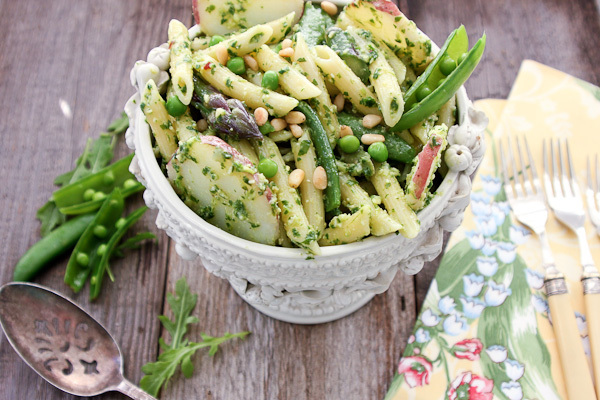 Your pasta looks mouth-watering, I love the pesto addition! I’ve never added potatoes to pasta…but I’m certain I’d be a fan! Delish!!! Potatoes and pasta? I’m in! I love how fresh this looks and I am sure tastes too! This dish looks fantastic. So fresh and light for summer. Never tried pasta and potatoes together but it sounds great! Thanks for a great recipe! This looks delicious! Definitely summer fare – perfect for a hot night dinner. What delicious healthy foods to combination together. Beautiful dish! I could eat bowls of this….all my faves combined in one bowl… brilliant!!! Potatoes are new again in my kitchen. They were off the radar for a while but it’s been so nice to have them, as you mentioned, for their versatility. I love your pesto–fresh, healthy and satisfying!